Ontario's co-operatives are an important part of the social and economic fabric of the province and play a key role in building a more sustainable and equitable economy. Unbeknownst to many, there are an estimated 1,500+ co-operatives, credit unions and caisse populaires in Ontario, operating in 1,900 locations and in 400 communities. Ontario’s non-financial co-operatives have more than $30 billion in assets alone, and $2.1 billion in revenue. The sector is owned by more than 1.4 million members and is supported by 49,000 volunteers. On average, about 30 new co-operative businesses are incorporated each year. A study released in November 2015 shows that Ontario’s co-operative sector contributes $5.97 billion yearly to the province’s GDP. The research study finds that the highest number of co-operatives are in housing and child care services, and that insurance, finance, agriculture and whole sale industries are the economic drivers for the co-operative sector in Ontario. The Ontario co-operative sector injects $3.3 billion into household income and is responsible for providing more than 57,000 jobs (full-time equivalents). 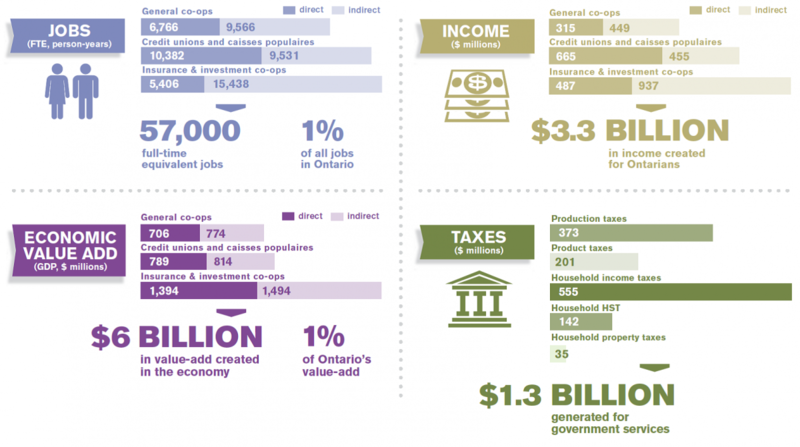 Ontario co-ops pay more than $1.3 billion in taxes annually. Ontario’s co-operative sector is a combination of financial co-operatives (credit unions, caisse populaires and insurance companies), and non-financial co-operatives which operate in about 20 key sectors of the Ontario economy. The largest sector in Ontario is housing co-ops (45%), followed by child care (17%) and financial services (17%). The fastest growing sectors are local (often also organic) food and renewable energy co-operatives. The above data was taken from the 2010 co-operative survey conducted by Industry Canada. 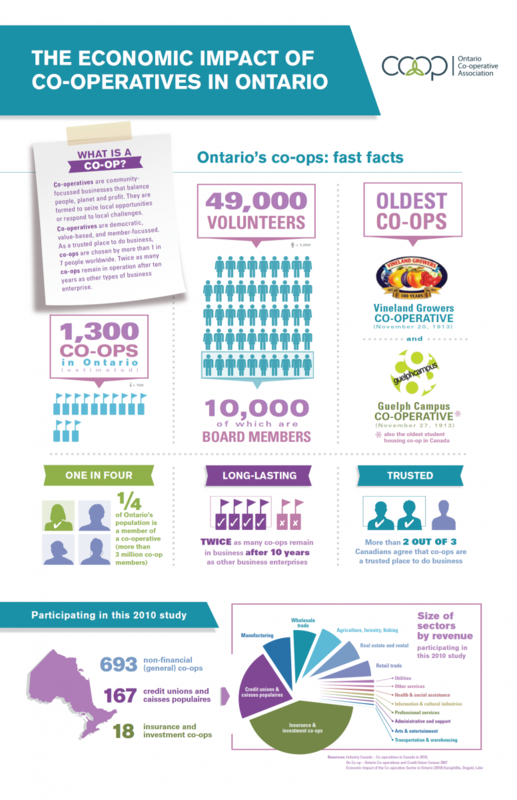 Click on the image to view The Economic Impact of Co-operatives in Ontario infographic. Check out A Silent Transformation to learn more about the transformative power that co-operatives have in communities across the province. While strong, Ontario's co-operative sector has not grown in proportion to other provinces. The province of Ontario counts for nearly 40% of both population and GDP of Canada, yet its co-operative sector accounted for only 10% of the national co-op activity. If Ontario’s co-operative sector had grown at the national average, the sector would have been four times as large as it was in 2010. Much of this slow growth is attributed to the overall lack of public understanding of the co-operative model, as well as our outdated legislation that makes investing in and developing new co-operatives a highly complex process. Visit our Government Relations page to learn more about how we are working to create a more favourable environment for co-operatives to grow and thrive in Ontario!